Total Septic Service professionals are your premier septic pumping and cleaning contractors in Davenport, Bettendorf, Eastern Iowa and parts of Western Illinois. Pumping and cleaning your septic tank regularly is one of the most important aspects of septic system care. You want the best for your septic tank, and that’s what we provide. Is it time for your system to be pumped or cleaned? One of the most dangerous assumptions about sewage disposal maintenance is in regards to pumping. Many people believe septic systems don’t need to be pumped unless something is wrong. This couldn’t be less true. It is recommended you get your tank pumped every 3-5 years, no matter how it appears to be functioning. In some cases, that number is actually closer to 1-2 years, depending on water usage. Regular pumping ensures your system for septic disposal functions correctly and efficiently. That bottom layer of sludge is where trouble can occur. If pumping is neglected, that layer of sludge will grow. Once the layer of sludge grows too large, the septic tank can no longer do what it is designed to do and wastewater flows through, untreated. Once the wastewater flows through the sewage-disposal tank it goes through a secondary treatment system. If untreated by the septic tank wastewater will clog the secondary system, causing it to back up and fail. This is when you get backed up cesspools and drain fields flooded with sewage. That drain field could be your yard. The easiest way to avoid this is regular septic maintenance and pumping. If it’s time for your regular septic tank pumping and cleaning in Davenport, Bettendorf, Moline, Rock Island and beyond – or you’re not sure how long it’s been since your tank was pumped or cleaned – now is the perfect time to call! Contact us at Total Septic Service today for all your sewer services. Servicing Davenport, Bettendorf, Eastern Iowa and Western Illinois! Providing quality and reliable septic tank services in Davenport, Bettendorf and all over Eastern Iowa and Western Illinois for over 18 years. 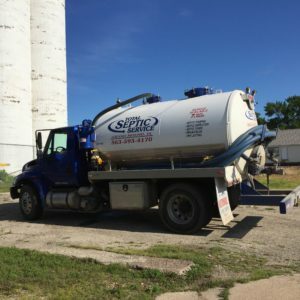 Copyright © 2018 Total Septic Service | Calamus, Iowa | All rights reserved.